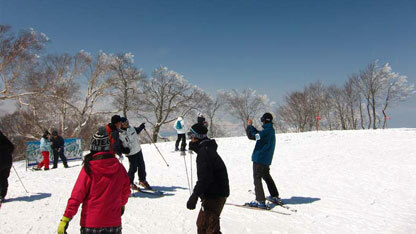 Nozawa Onsen is off the beaten track, but it’s still pretty easy to get to. When you arrive in Japan, you’ll probably come in to Narita International Airport. When I say it’s a big airport, I’m not kidding. Last time I arrived, I disembarked from the plane, then there was a short train ride to get to the actual airport and pass through customs! Getting through customs was easy. You need your passport, of course, which will be stamped with a 90 day tourist visa. They’ll scan your fingerprints (two index fingers) and take your photograph. This is done at the desk, and is a very efficient process. From the airport, you can catch a bus to Nozawa Onsen. This will take you about 5 – 6 hours, and costs around 12,000 yen. If you’re traveling in a group, you could also arrange a private direct shuttle for around 90,000 yen, which would handle up to 20 people. I opted for the more scenic route though, staying a night in Tokyo, and taking trains from there. So, you’ll want to take a train from the airport into Tokyo. There are a few train lines to choose from, and you can check timetables here. Catching the train in Japan? Consider the Japan Rail Pass. The Shinkansen goes from Tokyo, Ueno, and Omiya station – pick whichever is most convenient. Then sit back and enjoy the ride! It’ll take about 100 minutes to get from Tokyo to Nagano station. Nagano is a fairly large hub, and you’ll want to change trains here. Your destination is Togari Nozawa Onsen. You’ll be travelling on the JR Iiyama Line, and the ride takes about 60 minutes. This is a regular commuter train, with plenty of stops along the way. Get comfortable and enjoy the view from the window, which is pretty nice. When you debark at Togari Nozawa Onsen, you’ll want to catch a bus. I’m not sure exactly what it’s all called, but there is a small town around the station. The bus will take you through town, up the mountain, past some rice paddies, and into the ski village. It takes about 15 minutes and costs a mere 300 yen. There are two stops in town – check the map before you go to see which stop is closest to your accommodation.